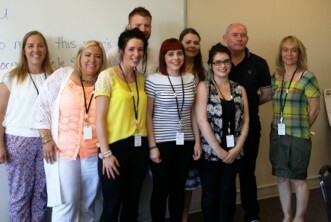 Eight students from the Queen’s University School of Sociology, Social Policy & Social Work in Belfast, Northern Ireland, led by Dr. Anne Campbell, just completed a two-week session of the CODA Social Work Scholars project. The Project was created to provide opportunities for international students and their professors to observe clinical services in the areas of addiction and mental health treatment. CODA, Inc., Oregon’s oldest opioid-addiction not-for-profit agency serves more than 3,000 patients, providing innovative, evidence-based treatment supported by a nationally recognized Research Department. During their visit the students spent time in CODA’s Portland Recovery Center, Hillsboro Recovery Center, the Women’s and Men’s Residential Programs at the CODA Gresham Recovery; and Tigard Recovery Center. The students also toured Portland’s innovative program, Outside/In, met with members of the Portland Police Bureau’s Behavioral Health Unit, and met with experts in the field, including Laura Nissen, Dean and Professor of Portland State University’s School of Social Work. The students from Queen’s are training to serve a population that faces the same addiction/mental health conditions we encounter in Portland, with the additional challenge of addressing the effects of trauma following generations of unrest and violence in Northern Ireland. They are eager to learn more about behavioral health and social justice in the States, and to share their unique experiences with their counterparts here. The demand for research, teaching, and evidence-based treatment in the addictions field is growing and it is global. The CODA Social Work Scholars Project believes that collaborations crossing geographic, political and economic boundaries have the best potential for success. –Tim Hartnett, Executive Director, CODA, Inc.